VGA Technology: Modular and Upgradeable MXM 3.0b; NVIDIA GeForce: GTX 1070, 1060 980M, 970M, 965M; 880M, 780M; AMD Radeon: R9-M290X; NVIDIA Quadro: K5100M, K3100M and K1100M. To help us nail down expectations of its fastest laptop GPUs, Nvidia sent over ten grand worth of Origin PC notebooks armed with GeForce GTX 780M, GeForce GTX 770M, and GeForce 765M cards. 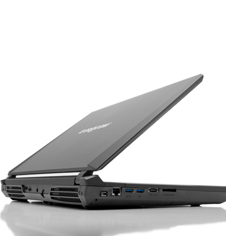 ...Eurocom could send over a comparable system with a Radeon HD 8970M-based module with the same cooling system. An identical thermal solution is one more way we can give you benchmark results that are truly apples-to-apples. But generally, after spending time with the Eurocom, I understand it. I know our evaluation unit carries at a very hefty pricetag, but if you pay attention to the configurations, you can get a very powerful, highly capable portable gaming workstation for not too much money. And if that sounds appealing, look no further, this is the computer for you.